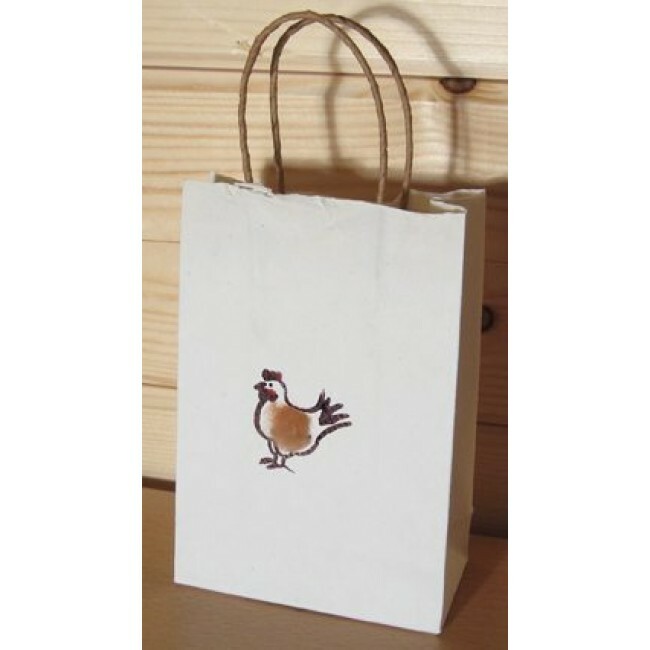 Our hen gift bag is made from the same gorgeous paper that we use for many of our pictures. They are handmade out in southern India and have a lovely rough edge along the top. All are similar but no two are identical; they are finished with a hemp string handle. We love them. This bag is finished by us in our Norfolk studio and features a little fluffy chicken or hen - a lovely finishing touch to a gift for a chicken fancier! The small bag measures 14 x 10 x 5 cms The larger bag measures 25 x 20 x 12 cms You may also like our other gift bags, with dogs, cats, bee, sheep and goats.